During an earlier time in our history, there were hundreds of one-room rural school houses dotted across the landscape. This is the recollection of one person who attended a one-room school. We thought we had it made. Now, I know we did. I attended a one-room country schoolhouse--Boston District Number Seven. It was a school with one classroom, eight grades, one teacher, and a room of multi-aged youngsters. We had a plethora of rich learning experiences which went well beyond the basic three R's. And the benefits of these learning experiences last not only for that season of my youth, but for a life time. And I will not forget. The school was several miles from my farm home, on Wohlhueter Road in the sun-kissed Boston Hills of southern Erie Country. We had unpaved rural roads at that time, in this beautiful hilly terrain. Rising before dawn, helping with the family farm chores, and then walking the several miles to school was the regular routine. Seasonally, the walk was met with the raw winds and snows in the winter, awakening brisk rains in the spring, and the aromatic breeze of the farm harvest season in the fall. My older sister and brother would often break track in the heavy winter snows or shield me from the raw rains in the spring. And, when I was older, I did the same for the younger neighboring children. Helping each other in-side and out-side of school was a lesson we learned well. The time of my youth, was the depression years of the mid 1930’s and we saw the onset of World War II in the early 1940’s. History tells us, these were not easy times but, as young school boys and girls, we thought we had it made. After all, when going to school, we had our school lunch buckets in hand, a pair of new mail order bib-overalls to wear, a school to which to attend, and our family and home to which to return at the end of the school day. We "had it made." School lunch hour and recess were also a high point of the day. Twenty boys and girls of all ages always had plenty to do. A soft ball game for some, a game of red light and green light for others, hilly-high-over ( as we called it), or a game of giant and baby steps. Sledding and skiing or a game of "fox and geese" was common in the winter. The school had twin stationary desks, a wood burning stove, no running water but a hand water pump in the back yard. There were hand-me-down books, a black board, and always a colorful in- season bulletin board. There was a genuine atmosphere of helpfulness. Often older students helped the younger. We all were students and "teacher helpers" and we had a job to do. By the time we reached eighth grade, we had already been exposed to eight grade materials the preceding seven years without realizing it. Those were exciting days of schooling in that one-room schoolhouse. Upon reflection, I realize that we had something that was very special. Music, the arts and sciences, and physical and manual training, were all coordinated within the curriculum. We had an educational experience that contained all the virtues of the most modern curricular innovations of today, including mastery learning, looping strategies, effective schooling, authentic assessment, integrated standards, and differentiated learning modules. But, in those days, they were not just part of an educational lexicon. Rather, they were just good, common-sense ways of teaching and learning. This one-room country school, Boston No. 7, has been closed now for many years. But the richness of what happened there, lives on in the hearts and minds of the learners, generation after generation. Ah yes, "we had it made", and we will not forget! 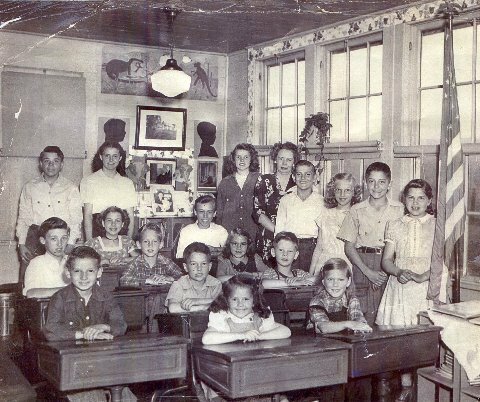 The students in the late 1940's of Boston No. Seven with their teacher Olga L. Herren, who lived on Trevett Road.